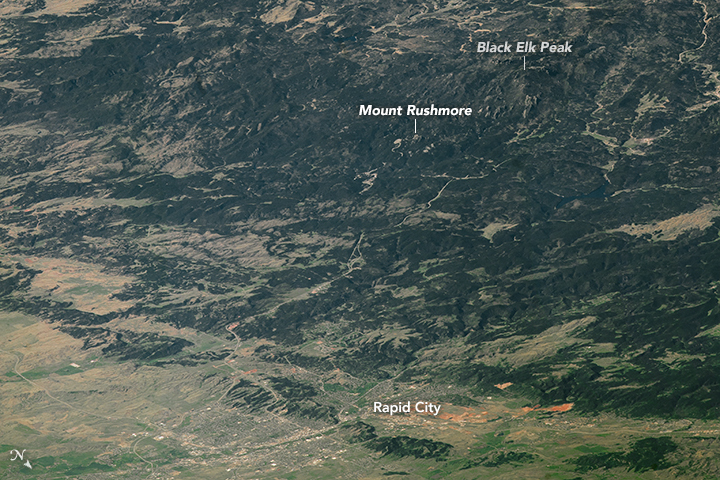 The Black Hills sprawl across South Dakota and Wyoming. They take their name from the Lakota phrase “Paha Sapa,” which describes the distant hills that emerge from the Earth. On May 4, 2016, an astronaut aboard the International Space Station took several photographs that were combined to make this mosaic. The dark, pine-covered slopes rise up from the Great Plains like an island from a sea of grass. 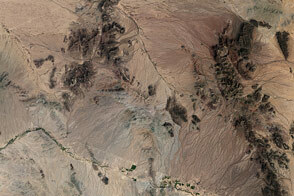 The mountain range stands 100 miles (160 kilometers) east of the larger Rocky Mountains. The tallest peak in the Black Hills, Black Elk Peak, stands more than 7,240 feet (2,200 meters) above sea level. It was renamed in 2016 after Nicholas Black Elk, a Lakota medicine man and healer. The Black Hills are home to a state park, a national park, a national forest, and some national monuments, including the Mount Rushmore National Memorial. In 2015, nearly three million people visited Rushmore’s immense granite busts of U.S. presidents George Washington, Abraham Lincoln, Thomas Jefferson, and Theodore Roosevelt. These aren’t the only sculptures in the mountain range; the unfinished Crazy Horse Memorial stands in honor of the eponymous Lakota warrior. 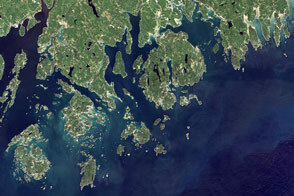 Several destinations also offer a firsthand look at geological history. At Jewel Cave National Monument, visitors can walk through the third longest cave in the world, which includes nearly 170 miles (270 kilometers) of mapped passages. Nearby, the museum at Mammoth Site, contains 61 woolly mammoth fossils—the largest such collection in the world. 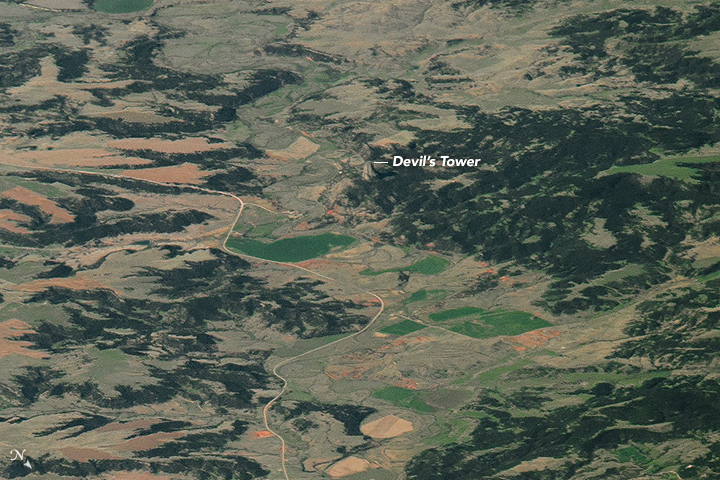 To the northwest, Devil’s Tower National Monument juts out of the pine forest. More than 860 feet (260 meters) tall, the butte has drawn rock climbers since the late 1800s. In October 1941, Devil’s Tower drew national attention during the six-day rescue of George Hopkins, a parachutist who got stuck atop it. The monolith, pictured below, has names in multiple Native languages. This year is the 100th anniversary of the National Park Service. We are celebrating this milestone with a gallery of images that you can see here. 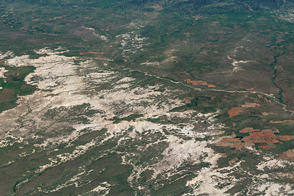 Astronaut photographs ISS047-E-98315 through ISS047-E-98336 were acquired on May 4, 2016, with a Nikon D4 digital camera using a 1500 millimeter lens, and is provided by the ISS Crew Earth Observations Facility and the Earth Science and Remote Sensing Unit, Johnson Space Center. 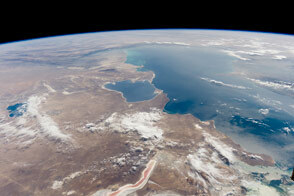 The image was taken by a member of the Expedition 48 crew. The image has been cropped and enhanced to improve contrast, and lens artifacts have been removed. The International Space Station Program supports the laboratory as part of the ISS National Lab to help astronauts take pictures of Earth that will be of the greatest value to scientists and the public, and to make those images freely available on the Internet. Additional images taken by astronauts and cosmonauts can be viewed at the NASA/JSC Gateway to Astronaut Photography of Earth. Caption by Pola Lem. The dark, pine-covered slopes rise up from the Great Plains like an island from a sea of grass. Black Hills & Badlands South Dakota (2016) Parks & Monuments. Accessed October 14, 2016. Mammoth Site (2016) Mammoth Site of Hot Springs, South Dakota. Accessed October 17, 2016. National Park Service (2016) Jewel Cave. Accessed October 17, 2016. 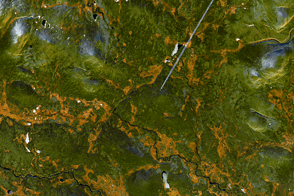 NASA Earth Observatory (2005, May 19) Drought in the Black Hills. United States Department of Agriculture (2016) Black Hills National Forest. Accessed October 20, 2016.